The Taw Velo Committee sit once a quarter to discuss the clubs welfare and to organise events and manage sponsorship, finance, club kit and anything else that can enrich the club for its members. They are all regularly involved in group rides, coaching and social events so should all be easy to get hold of, you can contact them via the website on a ride or at an event. You can also often bump into them at the Bike Shed Cafe so come and say hello if you see them and feel free to ask any questions. 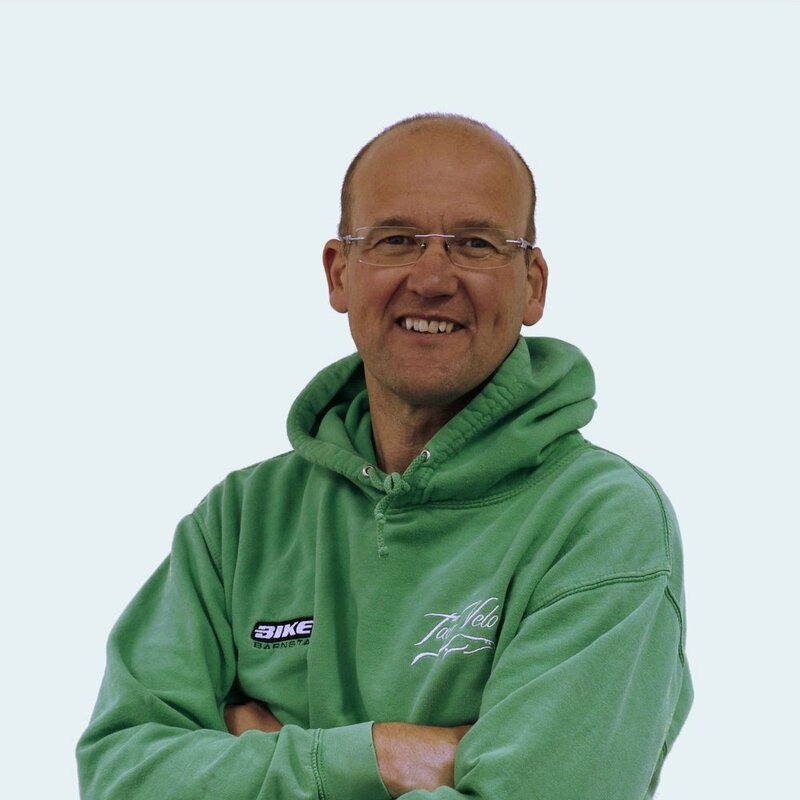 New to the post in 2018 Adrian has joined Taw Velo initially as Vice Chair before being moved to Acting Chair following the abdication of the incumbent. Adrian has been coaching at the club for three years since his son wanted to join a club. Cycling all his life Adrian began racing again for the fist time since child hood in 2016 and now competes in Cyclocross, Cross Country MTB, Time Trials and Triathlon. Adrian has a history of 17 years delivering sports coaching to a variety of age groups and disciplines and works in technology. Adrian will continue to lead the club into 2019 until the appointment of a permanent Chair at the next AGM. Being from Yorkshire Adrian is openly mocked for his choice of head wear. Cycling is fun, more people should do it and Taw Velo is a fantastic club to be part of. I never expected to get back into racing and find it so rewarding. Cherylyn first started cycling in 2015 but didn't pursue it initially due to spending a lot of time riding solo. It wasn't until 2017 when she discovered Taw Velo that her riding really took off. Cherylyn started racing in the south west Cyclocross league in 2017 and as Female Rider Representative for Taw Velo leads female focussed group rides each week. A Social rider in a family of racers and riders. With a love for a Brompton, Caroline commutes to work along the Tarka Trail most days. Caroline has ridden sportives including Dartmoor Classic and been a novice racer in SWCX. Caroline has conquered Alp du Huez and the Tourmalet. With a longest ride of 77 miles on the Taw Velo club social ride from Plymouth to Barnstaple. In addition to secretarial duties Caroline organises social rides and events. She joined the committee 3 years ago because 'If you can't beat them, join them'. Cycling has changed my social group, my fitness and my family. I have a lot to be grateful for belonging to this club. Becky has been cycling for about 6 years, and after hearing about Taw Velo from a friend has never looked back! Becky joined the committee in 2014 and works tirelessly as club treasurer and unofficial social liaison. You will see Becky on most club rides and tends to be the driving force behind the majority of the clubs organised trips and social activities. Becky races Cyclocross, Time Trial and Road and is part of the Taw Velo Club Coaching squad. I really appreciate all the help and support that comes from being part of a club network and I love being involved with all aspects of the sport. Darren was first involved in the club due to his son wanting to join a cycling club, meet new people, learn about racing and bike skills. Since then Darren has found himself getting more and more involved with club activities. Now serving as Head Coach and with the support of an amazing group of felow coaches leads the Taw Velo youth program. Darren competes in multiple race disciplines including Time Trial, Road, Cross Country MTB and Cyclocross. Riding bikes is an excellent way to get out and meet people. Always an enthusiastic cyclist and Andy's interest in Mountain Biking goes back to the mid ‘80’s when, with the good fortune to live near the Cairngorm mountains in Scotland, Andy enjoyed Mountain Biking in its infancy, some would say he was a pioneer! These days, Andy enjoys road cycling too, and regularly takes part in Sportivs and the occasional time trial. with a love for mud Andy also takes part in Cyclocross racing. Andy helps to run the Monday evening youth training rides and is working towards his MTB trail leaders qualification. I hope to take the MTB side of the club onwards and upwards! Paul has cycled all his life and has competed in Road Races, Criteriums and Time trials. Paul has a love for Italian roads and a passionate dislike of mud so you'll not see him at any cyclocross events but you may see him delivering roller sessions indoors over the winter. Paul Joined the committee in 2015 and works as the clubs kit liaison, using his strong relationships in the local cycling community Paul helps out with a variety of club community duties.